Senior Choral Scholar, David Whitworth. 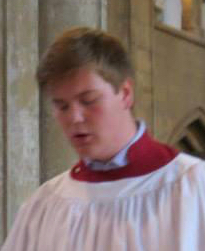 Very many congratulations to our Senior Choral Scholar, David Whitworth. Earlier in November, David took the Royal School of Church Music’s Gold Award examination. This is a rigorous examination, lasting for an hour, which tests musical ability but also understanding of liturgy and the Bible. We are delighted to say that David passed his Gold Award with Honours, obtaining 140 marks out of a possible 150. Very well done, David, and very well done to Robert Adams, Organist and Choirmaster of All Saints’, Waltham, and the Reverend Kimberly Bohan, Priest in Charge of Waltham, who prepared David for his exam. David has sung in the Minster Choir for very many years, first as a treble and, latterly, as a Counter Tenor. He also sings in the Choir of All Saints’, Waltham, the Grimsby Bach Choir, RSCM Voices North, and the RSCM Millennium Youth Choir. Next year, David will take up a gap year choral scholarship at Truro Cathedral. This entry was posted in Uncategorized and tagged All Saints, choir, Choral Scholar, David Whitworth, Gold, Gold Award, Grimsby, Grimsby Minster, Minster, Robert Adams, RSCM, Senior Choral Scholar. Bookmark the permalink. Great to hear of such a committed young singer of church music.